Not for the faint of heart. True India Pale Ales had to withstand long sea voyages before quenching the thirst of cranky British troops stationed in India. 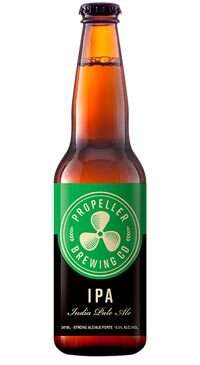 The Propeller IPA is true to this style. Its bracing, bitter and higher in alcohol (6.5%alc./vol) and made with the trademark Propeller quality. A full-bodied ale for full throttle beer lovers!